Along the walk through the grounds of Worcester College in Oxford. “The big thing to remember is Oxford is a town of private spaces obscured by walls that were built to defend the students and dons,” Casey wrote to us before we started our visit here. He had spent a term here back in his college days. How many years ago, Casey? Let’s skip the carbon dating of Casey and go to the truth of his advice to us. We have walked down Walton Street dozens of times on our way to the train station or just into the city center. Each time we have passed by the entrance to Worcester College, stopped to check on the hours it was open to the public and then gone on by as the hours never seemed to correspond with our walks. Finally, the opening times and our walks aligned, and we went in for a visit. I expected some old buildings, a sward of vibrant green grass (which you could see from the street through the open doors) and a YAC (Yet Another Chapel). I had no idea there would be so much more obscured by its walls. 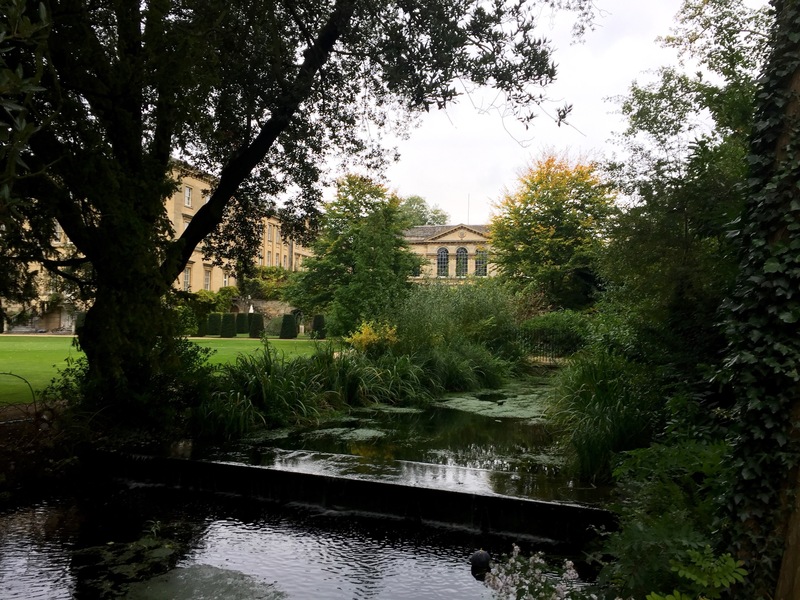 All of the above was there, plus a lake, centuries-old trees, gardens, a rugby pitch I envied and a circuitous walk that eventually led us back to the college entrance where we read about its history. Founded in 1714 (which makes it young compared to other Oxford colleges) on the site of Gloucester College, which started in 1283 as a “place of study for 13 monks.” Monasteries ended in 1539 (Can you say Henry VIII? ), and so did Gloucester College. The buildings served as palace and then entered 150 years of “chequered history” and decline. An endowment came to their rescue in 1714. Sir Thomas Cookes, a Worcestershire baronet, left the money for the founding of a college. 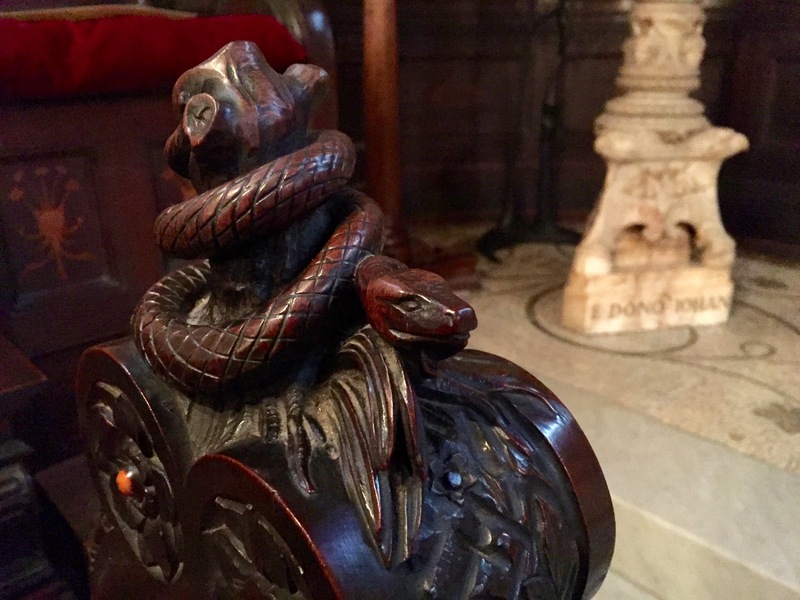 All the rail carvings in the chapel are of animals, including this serpent. The college, now near the center of town, was once at the edge of the city, which is how it came to have enough land to incorporate its athletic fields and gardens within its walls. Thanks, Casey, for the help in introducing us to Oxford. 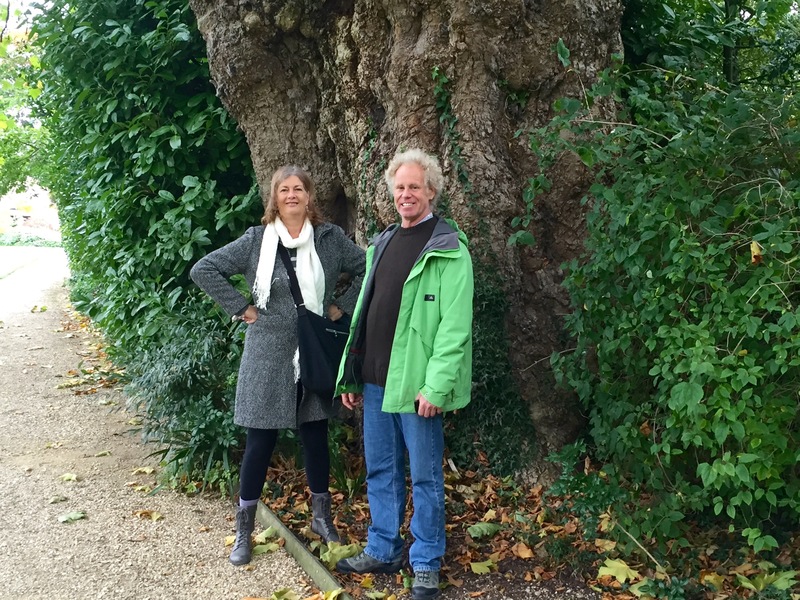 Kathy and Eddie stand in front of a massive tree trunk in the Worcester College gardens. 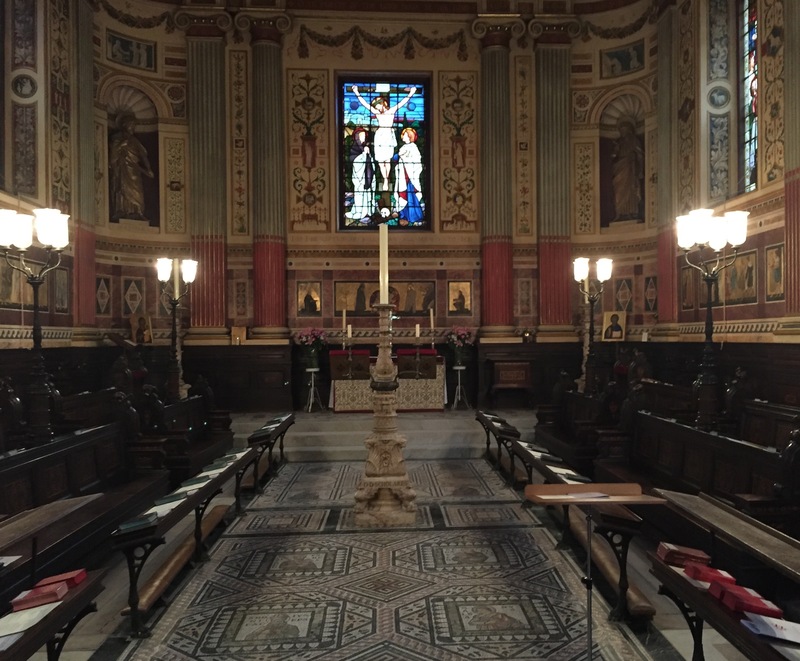 Posted on October 20, 2015 by jbsaulPosted in TravelTagged Oxford, Oxford University, Worcester College.